McStas is a general tool for simulating neutron scattering instruments and experiments. 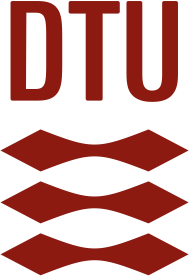 It is actively supported by DTU Physics, NBI KU, ESS, PSI and ILL. Simulated scattering from a hollow-cylinder vanadium sample. The plot shows the intensity of scattered neutrons (red is highest intensity). The sample is at the center of the sphere with the neutron beam coming from the left. Clearly seen is the shadowing effect of the sample causing a lower intensity opposite the beam. Also seen is the effect of the non-symmetric geometry of the sample, causing lower intensity directly above and to the side of the sample. 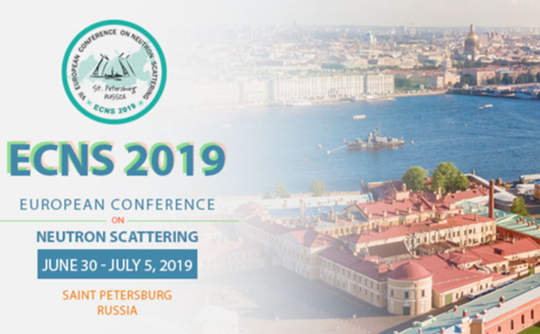 The workshop Innovative Simulation Tools, Shielding and Instrumentation 2019 (ISTSI2019) will be held at Holiday Inn St. Petersburg, Russia, on Saturday June 29th 2019, as a satellite of the ECNS conference. 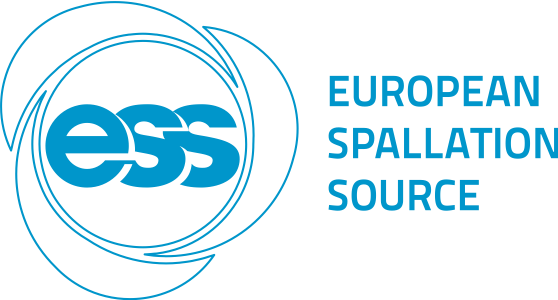 This workshop / project has received funding from the European Union's Horizon 2020 research and innovation programme under grant agreement No 654000. In collaboration with the China Spallation Neutron Source, the McStas team participated in the first ever McStas school in China in the last week of March. Further, our hosts suggested we recorded videos of the lectures which are slowly becoming available on the new McStas youtube channel. 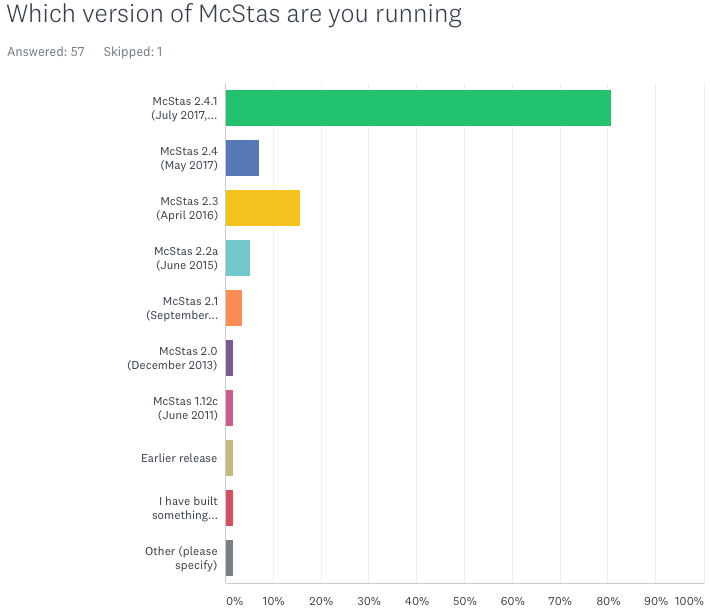 The results from the 2018 McStas user survey are now online at http://survey2018.mcstas.org. Q1: McStas users tend to upgrade to the latest release. Q2: Linux is by a large margin the most used platform, followed by Windows 10 and macOS. 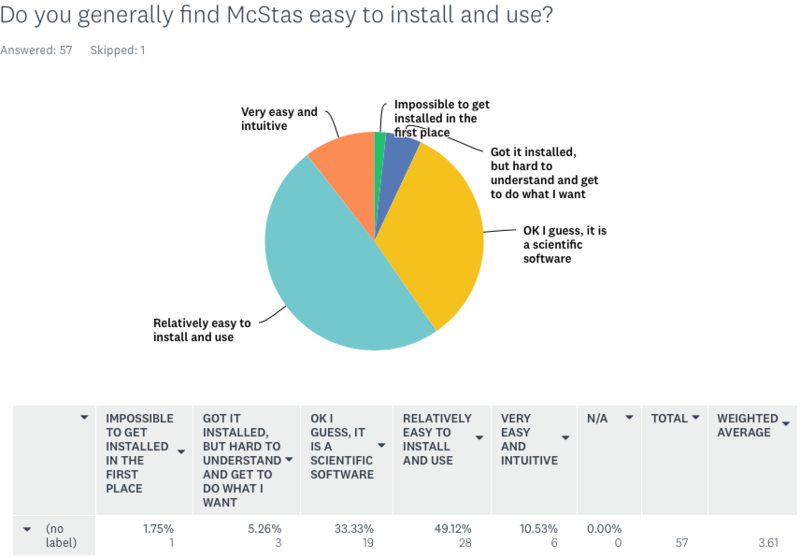 Q3: McStas are generally happy about the installation and use of the package. Very few people have issues with installation. Q4: The most used tool set is the default Python version, default since v. 2.1. 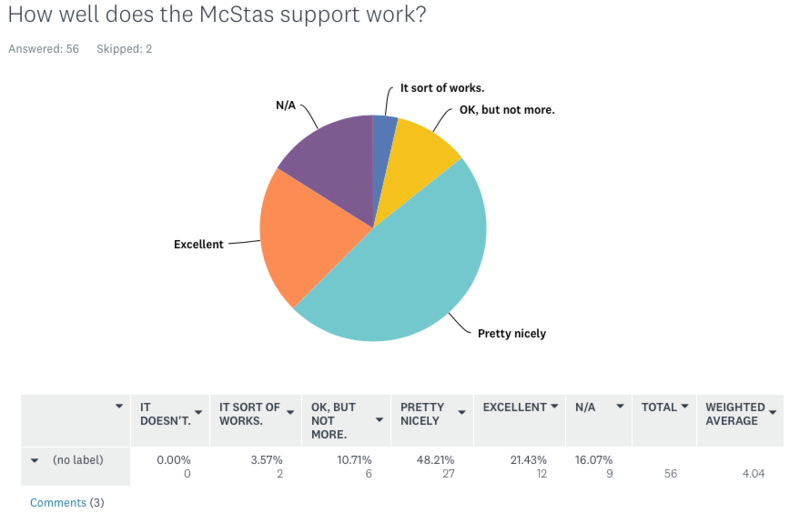 Q5: McStas users seem very satisfied with the user support. Q6: McStas users tend to trust McStas to large extent. But please don't trust it blindly!! Q7: McStas users mostly compare with experimental data or analytic / back of envelope calculations. Q8: McStas users have widespread knowledge of all documentation resources - but we should probably disseminate the wiki further. Q9: The individual suggestions/questions/comments/... will be answered through individual GitHub issues. Q10: McStas is used on all continents that have / are planning neutron scattering infrastructure. Users are mostly based at these facilities, but also at other research labs or universities. Thank you very much for the (generally) very positive review - also, you are more than welcome to participate in continuing debate on user suggestions that will take place in the individual GitHub survey issues. Previous news items: 2018, 2017, 2016, 2015, 2014, 2013, 2012, 2011, 2010, 2009, 2008, 2007, 2006, 2005, 2004, 2003, 2002, 2001, 2000, 1999, 1998.